All potential members need to fill out this application. Please do so by clicking here. Students audition for the drumline can move into their Fall housing starting Sunday, August 18th, 2019 at 9:00 AM. Students wishing to move in on Saturday, August 17th may do so at an additional cost of $50. Please contact the Department of Residence for details. If students do not make the final drumline, they will still be allowed to stay in their residence hall at no additional cost. A new technique packet will be sent out via e-mail starting on June 1st, 2019 to all who are registered for summer camps and auditions. Anyone who registers later than June 1st, will receive the packet via e-mail shortly after registering. This packet has no cost. To register, please click here. The audition will include an individual and group audition. 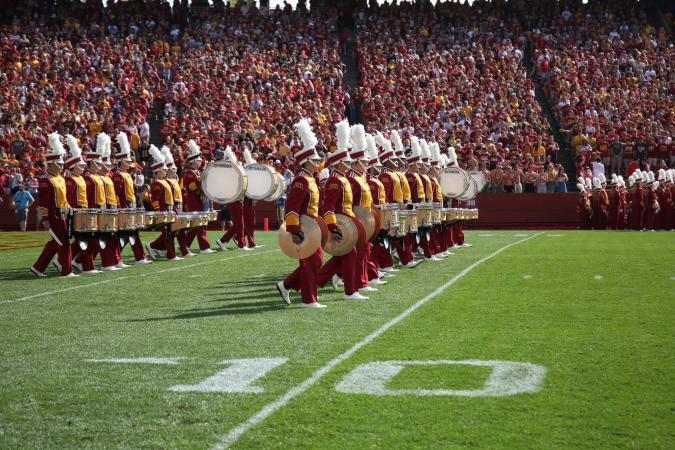 The Iowa State Drumline is a dedicated group, continuously striving for improvement. While our rehearsal and performance schedule might seem overwhelming, please remember we are also committed to having fun. We look for members with a positive attitude who are willing to work hard to deliver an outstanding performance.